I’ve always disciplined myself and would advise others to not respond, comment or acknowledge (openly) a situation when your personal feelings are in turmoil. If my thoughts and emotions aren’t leveled, I’d be putting myself on the defensive which could ultimately result in me saying or acting in a way that I might…just might, regret. That’s what I’ve believed until now. But now I have to speak out. going on 17. Every day he commits the “crime” of being a beautiful black boy walking, while holding skittles and IceTea! Being a mother in today’s world, I’m in a state of panic. Every day before February 26th I worried about life’s various situations, and how that we (his parents) play the most essential role in his development and thoughts about society. We can (and need) to make sure that we talk with him, teach him how to handle himself, and ensure that he learns to navigate himself through life and come out of with the sense of dignity and pride about in who he is. That’s what we’ve tried to instil in him. I’m in a state of panic because according to society’s actions and behaviour, I am presented as a liar in the eyes of my son. When I say to him, “You are a gift from God and you count not only to us (your family and friends), but to the whole world”, and “You are going to grow old and achieve all that your heart desires, you are the handsome beautiful future of our world and all you need is to stand tall”, what message does he get when he takes a look at the evening news? I intentionally did not address any fears of racism or inequality as I didn’t want it to be part of his every day check list of “things” to remember. These are “things” he needed to be aware of but not to worry about. However, on February 26th 2012 when that fatal gun shoot took Trayvon Martin’s life, it also clearly brought to light that we live in a country where “some” still believe that being Black is a crime: that the colour of our skin is our downfall in this world. Right now, I am being made to believe that from the time we (as black people) decide to give birth, we seemingly give our unborn kids the “privilege” of a criminal stigma as it is inherited with their skin colour. 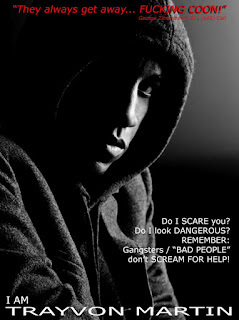 My son, My Trayvon Martin is committing the crime of living while black… How do I teach him to deal with that? How do you teach your Trayvon Martin to accept the fact that, although he might be a bright student, a kind hearted child and a potential future leader, he will inevitably (sometimes) be looked at through the ugly lens of discrimination? How do you teach someone to live their life with a pure heart while they deal with discrimination? How do you teach someone to gracefully handle being judged; not because they have done or said something offensive, but because their very presence in itself, is offensive to some. That’s a hard lesson to teach, even for a brilliant Ivy-League professor. Maybe Treyvon Martin should have known that wearing a “hoodie” sent the message that he’s dangerous, mad at the world, armed and ready to kill anyone who looks at him twice… That can’t be how this world thinks, can it? It is astonishing to me, that 27 days after the cold-blooded MURDER, the real Trayvon Martin’s parents (and all the parents of all the Trayvon Martin’s of this world) have not seen justice served. It is mind boggling to me that as a society, we have to cause uproar to gain attention and provoke reaction for a situation that already screams LOUD and CLEAR of injustice. What is America? Who is America? What happen to America the self-proclaim land of opportunity and equality? But more so …Who is America? America, which is known as “the land of the free and the home of the brave”, and a welcoming country, in the face of this tragedy, needs to prove its stand against injustice. 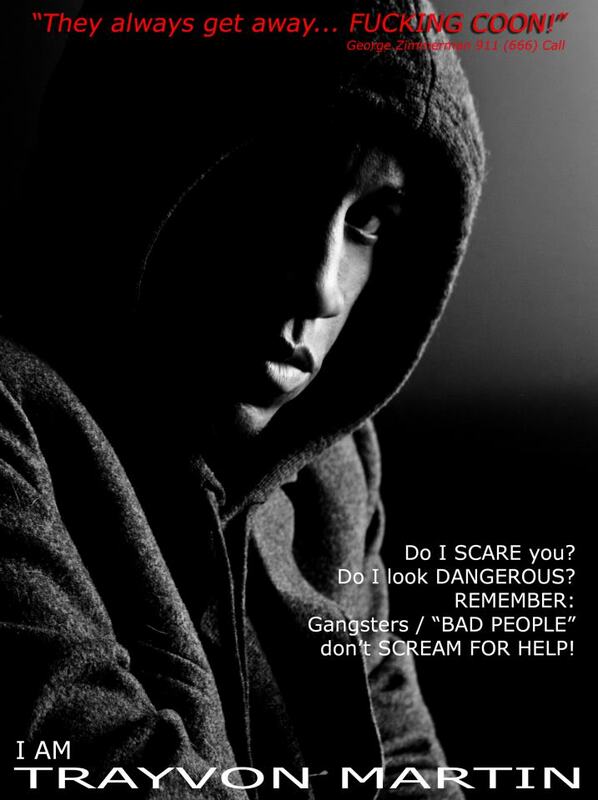 It must take a stand against vigilantes and resolve the common practice of stereotyping. America needs to do the right thing in this totally disgusting situation for ALL the Trayvon Martins of this world; let not this senseless death be in vain because we are all Trayvon Martin of this world! I bought a box of condoms today. Whoa… did that sound as awkward for you to hear as it felt for me to say? You’ll have to excuse me, but I never imagined that I would need to have this conversation with you so early. Nevertheless, here we are. And it’s just as awkward as I’ve heard other parents say it is. But I have to admit that I didn’t buy a box of condoms today so that we could sit, look awkwardly at each other and have “the talk”. I actually bought them because at this moment, I’m not sure that I can provide everything you need to be able to survive in this world. The truth of the matter is that you are little more than the sparkle that I see when I look into your mother’s eyes. That’s right -- you’re not even here yet -- not even in your mother’s womb, but still there are some things I want you to know, so listen up. I have thought about the prospect of being your father for years. I tell every one of my friends that I just know you’re going to be a boy -- my first child, my first son. See, I picked the name Xavier Lawrence a long time ago (even though your mother wasn’t a big fan of it at first). I always imagined that your boys would call you XL… because you’ll have this larger than life personality -- witty, sociable, serious when needed, always smiling and cracking jokes, able to fit into any situation --- kinda like your Pops. But you’d be XL to me and your mom for a different reason. See, it will always remind you of the underlying expectation for you to excel… at everything. Because that’s the only way that you will achieve the hopes and dreams of your childhood. And what your mother and I want more than anything for you, is the chance for you to understand that you can be anything you want to be, but you must be willing and able to be the best at whatever it is you choose to pursue. I have all of these things that I want to teach you and I know we have a great deal to teach other, but the fact still remains that I bought a box of condoms today. Anyway, I want you to know that God has been preparing us for you. I finally got my clinical licensure a few weeks ago, so that means I got a raise at work. Oh, and your mother and I are getting ready to buy a house! That probably doesn’t mean much to you now, but I want to make sure you grow up having a place to call home, you know? None of that moving from apartment to apartment every year or so. You’ll have a house with a yard for you to play in and some grass that you’ll eventually be cutting to earn your allowance --- just like I did. I’m doing everything I can to make sure we’re ready for you, but still, I bought a box of condoms today. My Dad, your grandfather, taught me everything I needed to know about manhood. And just so you're prepared, he’ll probably be happier than anybody to finally get a chance to meet you and harder on you as you grow as well. When I was a kid, he always had a story to share that would help him in explaining those hard lessons he had to teach me --- the ones that required that I have harsh consequences in order to make me understand that life isn’t easy and nothing worth having in this world will be given to you. So in preparation for your arrival, I’ve been thinking of all the things I want to pass along to you and gathering my stories as well. I am going to tell you about Ralph David Abernathy, Fred Shuttlesworth, Joseph Lowery and other well known Civil Rights pioneers while I’m sure your Mom will want to give you the full gamut of knowledge regarding Ella Baker, Diane Nash, Septima Clark and many of the other women who were involved, but are not often recognized as being part of the movement. I also have to tell you about some of the injustices of my day involving people that look like you: Sean Bell, Ammadou Diallo and even Troy Davis. Those will be hard to explain, but I’m ready to show you how you can avoid even finding yourself in some of these situations simply by learning to choose your friends wisely, being cognizant of the places and things you allow yourself to be involved with and not even getting involved with the legal system if you don’t have to be. There’s so much I have to teach you, but still I bought a box of condoms today. I know I spoke previously about my heavenly and earthly fathers’ efforts to prepare me for your arrival, but today, I simply don’t know if what they’ve offered is enough for the challenge at hand. See, I know that I can show you the importance of walking upright in the physical and the spiritual realms. I can teach you how to be a man of integrity, to walk with confidence, to speak life and peace with your words. I can show you how to dress appropriately, how to tie a tie and how to line your belt buckle up with the buttons on your shirt and your zipper because Hayes Men are always well dressed and prepared. I can even teach you how to respect women, your parents, your elders, and your fellow man. But I bought a box condoms today because of the things that I can’t teach you. I don’t have the tools to show you how not to look suspicious to the George Zimmerman’s of the world. What can I tell you that would assist you in looking less threatening to a self-appointed neighborhood watch captain who might follow you with a 9mm handgun as you are armed only with a bag of skittles and an Arizona Iced tea? I don’t know how to teach you to stay calm or not fight for, scream for and beg for your life when you’re scared to death of a strange man with a gun who has walked up and grabbed you for no apparent reason. I don’t know how I would tell your mother that you were lying in the morgue for a full 3 days with a “John Doe” tag on your toe because investigating officers never thought it was possible that your family lived in the gated community where you were assumed to be preparing to commit a crime. How would we cope with your life being taken from you, from us or from the world just because you’re young, black and unfamiliar to a person who doesn’t know and shouldn’t care who you are? How do I teach that? What advice might I delve out that would save you from a man that represents a society that preaches equal opportunity for all Americans while simultaneously preparing for and systemically arranging your demise? I have no idea how to explain that to you X… no idea how to steer you around it… no idea how to save you from it. And as you can see, I have way more questions than I have answers --- So I took the only other step I could to save you. I bought a box of condoms today --- and I decided to never give you life. Because even though I’d teach that almost nothing in this life is guaranteed, I don’t want you to have to learn what Trayvon Martin did-- that as a black man in America, your 18th birthday is one of those many things. There's not much more I can say. Just know that I loved you son -- Even before I knew you. 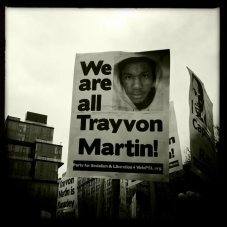 We are Trayvon Martin, we are George Zimmerman. Who do you want America to personify? Which America do you want to prevail? With this food for thoughts I leave you , remember to show love and appreciation.